1. 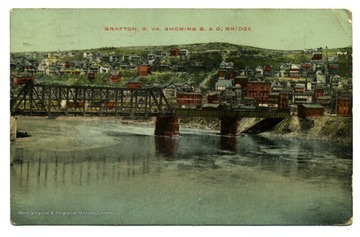 New Bridge at Grafton, W. Va.
New Bridge at Grafton, W. Va.
Grafton, W.Va. near bridge with town buildings on the hillside. 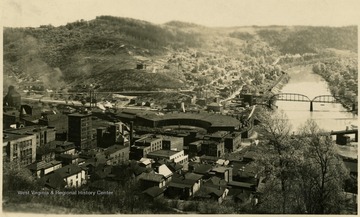 View of Grafton, W. Va. showing buildings on a hillside and bridges. 3. 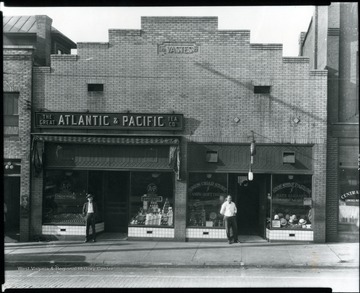 Great Atlantic and Pacific Tea Company Grocery Store, Grafton, W. Va.
Great Atlantic and Pacific Tea Company Grocery Store, Grafton, W. Va.
Outside view of The Great Atlantic and Pacific Tea Co. Grocery Store in Grafton, W. Va. Two men standing in front of the entrances. 4. 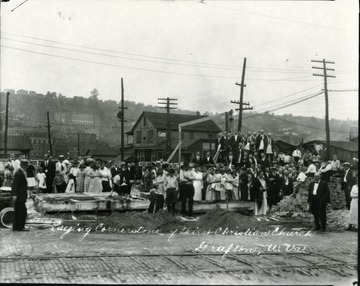 Laying Cornerstone of the First Christian Church, Grafton, W. Va. Laying Cornerstone of the First Christian Church, Grafton, W. Va.
"Corner of McGraw Ave [and] Beech St. 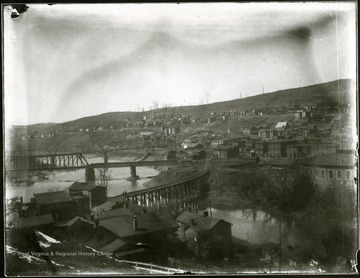 Downtown in background is Post Office and High School." 5. 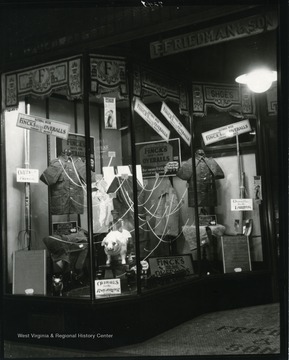 Friedman and Son Clothing Store Window Display, Grafton, W. Va.
Friedman and Son Clothing Store Window Display, Grafton, W. Va.
Front entrance and window display of Friedman and Son Clothing Store on Main Street in Grafton, W. Va.
7. 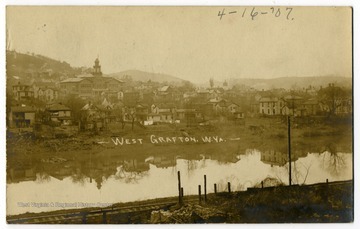 West Grafton, W. Va. 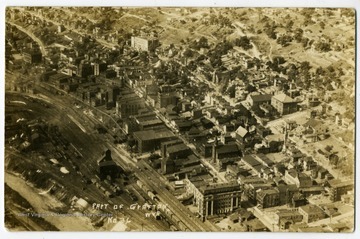 The city of Grafton is in Taylor County. 8. 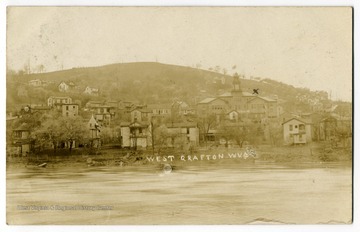 West Grafton, W. Va.
A View of West Grafton across the river. 9. 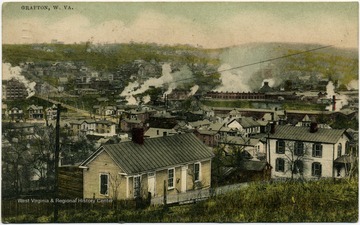 West Grafton, W. Va.
10. 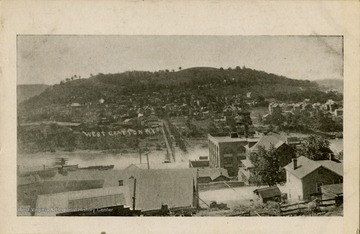 Aerial View of Grafton, W. Va.
Aerial View of Grafton, W. Va.
12. 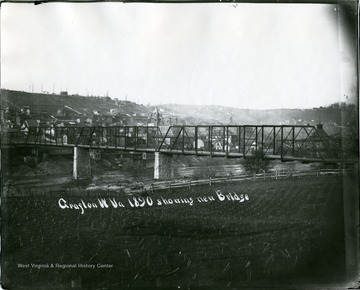 Baltimore and Ohio Railroad Bridge, Grafton, W. Va.
Baltimore and Ohio Railroad Bridge, Grafton, W. Va.